Tile scarf of the sand and gray temple in 82% pure new wool and 18% extra soft cashmere available in narrow version 220cm * 27cm or wider version: 220cm * 55cm, hand fringed finish or black cotton bias on both sides. finish: fringed hand or both edges on the lengths will be finished with a black bias (liseret) of 1cm wide. 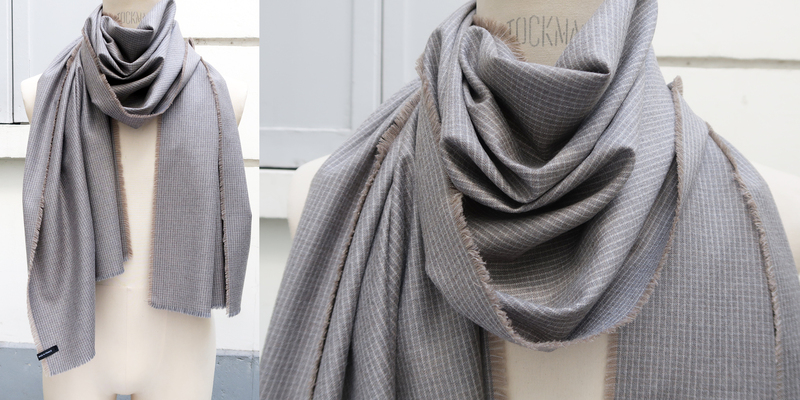 A so chic and luxury scarf, perfect for cold Parisian duck and as an accessory in the evening on a city outfit but also worn more casual on a more casual look. Ultra luxury, this tailor is a reflection of the French know-how of the time and often woven with processes that are now gone. Extremely refined this fabric is of a very very good quality. To preserve all the prestigious quality of your scarf, I recommend Dry Cleaning. Under no circumstances is an exclusive tailoring fabric, in such prestigious compositions, such as a cashmere or pure virgin lamb wool, to be put to the machine. That is why it is important to pay the greatest attention to it. After use, always unfasten your scarf and store it preferably laid flat without marking the folds, or hanging on a hanger. Do not hang your scarf on the hook of a coat door to avoid unsightly deformation. If your scarf is wrinkled, you can iron it. I recommend using a piece of cotton (wet leg) between your scarf and the iron, to avoid burning or polishing your scarf.